In Tech note “Fiber Types and Using Them Effectively”, the purpose of Mode Conditioning Patchcords (MCP) is explained, i.e. it was originally intended to enable 1000BaseLx type Gigabit Ethernet equipment designed and optimised for operation over singlemode fiber to work over conventional multimode fiber. Essentially, all the action is at the transmit end where a singlemode fiber is spliced to a multimode fiber with an offset of 16 to 23uM for 62.5/125 fiber (and 10 to 16uM for 50/125 fiber) which forces most of the light to travel in the higher order modes and thus avoid the “bad” low order modes. The MM fiber is then connected to the MM cable plant. At the other end a standard matching MM patchlead is used. 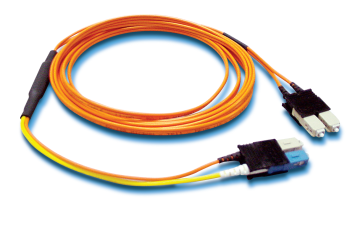 Consequently, standard Mode Conditioning Patchcords are duplex assemblies consisting of one MM cord and one SM/MM cord as shown in Figure 1 below. In this case the SM cord is coloured yellow and the MM cords are orange. Mode Conditioning Patchcords are available from many vendors so it is important to know where and when they should be used. Mode Conditioning Patchcords are normally used in pairs. That means that you will need a Mode Conditioning Patchcord at each end to connect the equipment to the cable plant so that these cables are usually ordered in even numbers. While Mode Conditioning Patchcords are typically used in duplex systems such as Gigabit Ethernet, it is quite possible that they may be needed in one way systems. For example, many CCTV video links employ a high speed forward path carrying from 4 to 16 uncompressed digital video channels so that it may be operating at anything from 600 to 2500Mbps whereas the reverse path will operate at far lower speeds because it only carries signals such as data, audio, IP or contact closures. 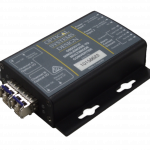 With such equipment it is only necessary to use a simplex MCP at the high speed transmitter end if operation over MM fiber is unavoidable. Of course, with singlemode fiber based cable plant none of this is required: another good reason for moving to singlemode everywhere!